The 28th Annual Dana Crawford and State Honor Awards are scheduled for Wednesday, May 9 at Seawell Ballrom in Denver. We hope you’ll join us to celebrate excellence in historic preservation and honor this year’s award recipients. Contact Jennifer Orrigo Charles to purchase tickets for the evening ($185). 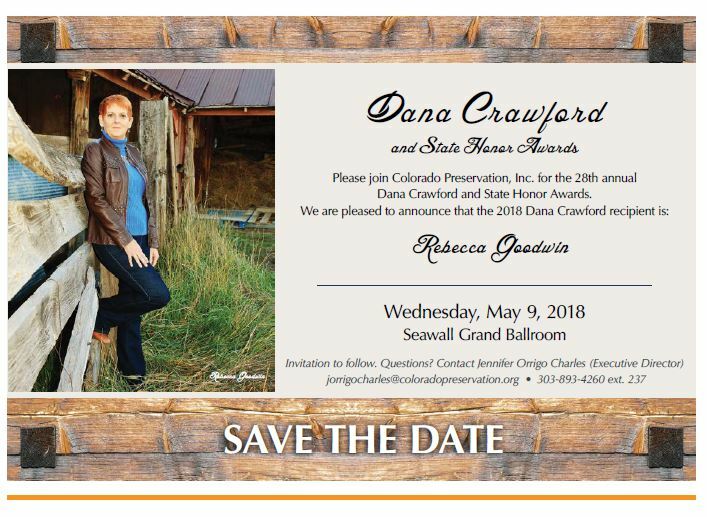 Listed below are the sponsorship opportunities and benefits for the 2018 event – please contact Jennifer Orrigo Charles 303-893-4260 x 237 to indicate your intent to serve as a sponsor and secure your table. Thank you to our current sponsors for their support of the event and of historic preservation in Colorado! Future lunch for two with Dana Crawford! For additional sponsor or ticket information contact Jennifer Orrigo Charles at 303-893-4260 ext. 237.